It’s time for #FilltheCookieJar again! I took a break from this group in January because after the holidays, I was a bit cookied-out. But with Valentine’s day just around the corner and that being our theme for February, I simply had to participate! Fill the Cookie Jar is a group of bakers who gather together each month and share cookie or bar recipes based on a theme. It’s hosting by Cynthia of Feeding Big. Thumbprint cookies were on my holiday baking list but I never got around to making them, so I was thrilled to finally be able to whip some up now. 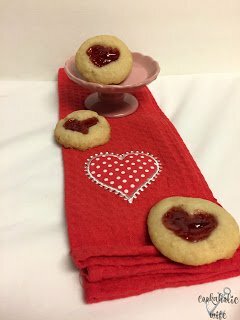 Thumbprints are such easy cookies to make and they’re really versatile since you can add any flavor of jelly, jam or preserves to them. In light of Valentine’s day I decided to go with the classic strawberry. 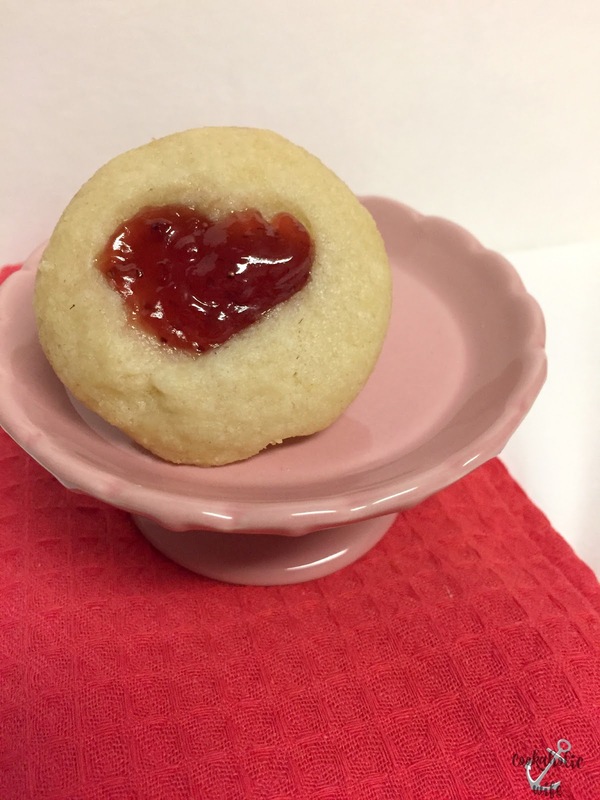 Heart shaped thumbprint cookies are are sugar cookie base dotted with strawberry jam. These cookies would be adorable for Valentine’s day. 1. In a medium bowl, combine the flour and salt. Set aside. 2. In the bowl of a stand mixer, combine the butter, sugar and vanilla extract. Beat on medium speed until light and fluffy. 3. Add the flour mixture and mix until combined. Turn out dough onto a sheet of wax paper and wrap up. Refrigerate for 1 hour. 4. Preheat the oven to 350 degrees. Line a baking sheet with parchment paper. 5. Scoop dough into 1-inch balls and place 2 inches apart on the prepared baking sheet. 6. Using your thumb, press down two overlapping indents to create a heart shape. Fill each cookie indent with ¼ teaspoon of jam. 7. Bake for 15 minutes or until the cookies are lightly browned. Remove from the oven and allow to cool on the baking sheet for a few minutes before transferring to a wire rack to continue cooling. Buttery, perfectly crunchy and filled with sweet strawberry jam! I’m sure your Valentine would be more than thrilled to receive these for the holiday! I've been wanting to make a thumbprint cookie for my husband's aunt and these will be lovely to send. A great way to show your love. I'll use raspberry jam, which is her favorite! I often make thumbprints at Christmas but Valentine heart ones might be my new favorite, Nichole! Awww…I love the heart shaped thumbprint! You can't go wrong with Thumbprint cookies and perfect for Valentine's Day. So easy yet so pretty. I haven't made thumbprint cookies in years. Thanks for reminding me of how fun they can be. Very clever making the indentation in the shape of a heart. Thumbprints are always a hit. 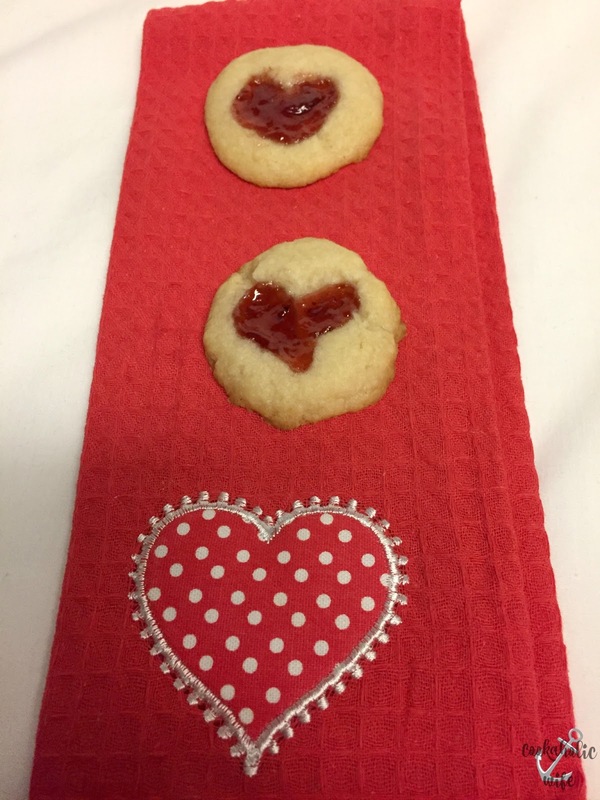 Thumbprint cookies remind me of my dad as they are his favorite and I love how you made the thumbprint into a heart~ so festive.